As one of the largest predators left in Britain, the fox is captivating: a comfortably familiar figure in our country landscapes; an intriguing flash of bright-eyed wildness in our towns. Yet no other animal attracts such controversy, has provoked more column inches or been so ambiguously woven into our culture over centuries, perceived variously as a beautiful animal, a cunning rogue, a vicious pest and a worthy foe. As well as being the most ubiquitous of wild animals, it is also the least understood. In Foxes Unearthed Lucy Jones investigates the truth about foxes in a media landscape that often carries complex agendas. Delving into fact, fiction, folklore and her own family history, Lucy travels the length of Britain to find out first-hand why these animals incite such passionate emotions, revealing our rich and complex relationship with one of our most loved - and most vilified - wild animals. This compelling narrative adds much-needed depth to the debate on foxes, asking what our attitudes towards the red fox say about us and, ultimately, about our relationship with the natural world. Well I know us booklovers aren't supposed to judge a book by its cover, but how Fantastic Mr Fox is this cover? The hypnotic amber eyes of the beautiful fox stare out from the front cover, almost daring you to have a peek inside...and I, for one, was completely powerless to resist. A few months ago I wouldn't have been terribly interested in reading a book about foxes, but then a rumour started to spread in my street: a fox had been seen early in the morning walking down the middle of our street. A real live fox? In a housing estate in Gateshead, surely not! Possibly yes, having read Foxes Unearthed and found out some of the quite unbelievable places a fox has been spotted. City fox, Romeo, wins the award for the most unconventional place for a fox to live. Without writing as if it is a textbook, Lucy Jones has introduced us to many fascinating facts about foxes. Foxes have been part of the British landscape for many years, we even use fox and foxy in our language. Aside from somebody saying they've been foxed or describing a lady as foxy or a vixen, there's also the eye-opening root of the word 'shenanigans'. I loved the historical aspect of the book. I really enjoyed reading about foxes in Tudor times where they were thought to cure all manner of ills, although I wouldn't fancy using particular bits of foxes to cure a migraine or toothache. It certainly made for entertaining reading though. 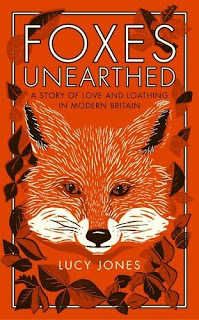 Whichever side of the fence you sit on, be it foxes are vermin and should be destroyed or foxes are part of our landscape and should be cherished, there is something for everyone in Foxes Unearthed. Lucy Jones has done an amazing job of getting behind the scenes of both hunters and saboteurs to investigate the controversial subject of fox hunting, just don't ask Ricky Gervais what he thinks unless you have a spare few hours! 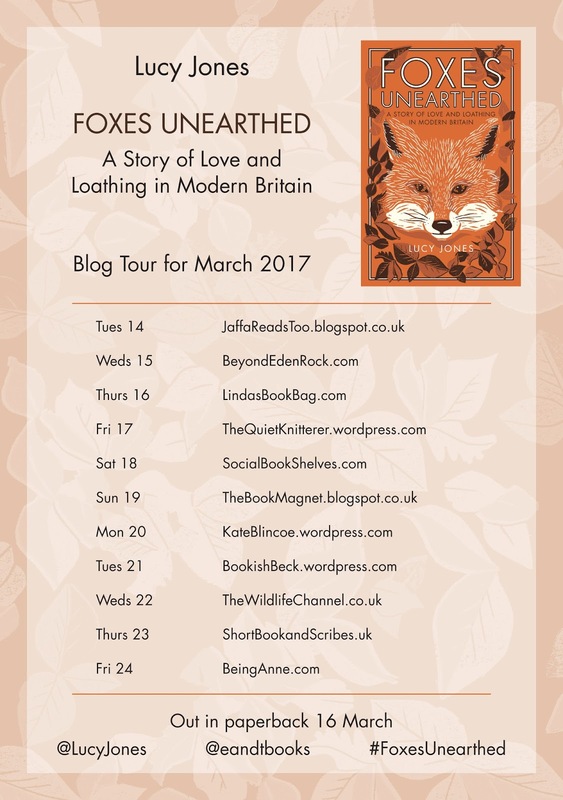 You don't have to be a nature or wildlife lover to enjoy Foxes Unearthed; it contains such a variety of information relating to foxes that some chapters will naturally resonate more than others. 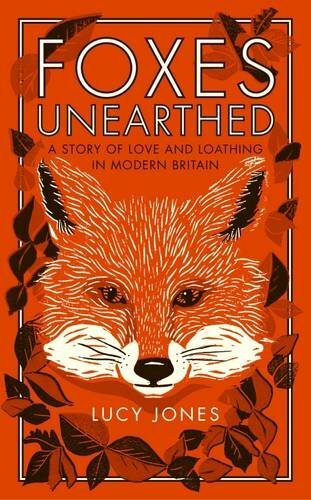 In Foxes Unearthed, Lucy Jones encapsulates such a range of information from fictional foxes and hidden homage in TV shows to the controversy of fox hunts and foxes being kept as pets. I certainly know a lot more about foxes now and it's really made me think about how foxes are rooted in our very history, both through our culture and our language. Surely something so incredibly priceless deserves to be preserved.